Happy Memorial Day a week late! For pretty much my entire life, this holiday has included the local Memorial Day parade which is nothing amazing, but it's tradition and I enjoy it. A lot of local businesses, schools, churches, organizations make up this event which is basically a huge ad. But I love it! And they throw candy!! :) After the parade, my family and I have been getting together with a group of good family friends for brunch which typically includes homemade waffles and whatever else people want to bring. This is usually a good time to try out a new recipe, see how it goes over with a crowd. This year I decided to go seasonal and picked a rhubarb recipe; a strawberry rhubarb Bakewell tart. A Bakewell tart is an English pastry made up of a shortcrust pastry shell with jam and frangipane. This one used strawberry jam and then topped everything with fresh rhubarb, the best combination! I had such a fun time making this tart. I loved layering the beautiful pink rhubarb in a herringbone pattern on top of the delicious frangipane. There are quite a few different components to this dish. None of them are especially difficult, but it does take some time to put together. I found that the amount of frangipane that this recipe made was too much from my tart pan. When making this again, I would probably cut back to 3/4 of the frangipane recipe, or even 2/3, as my frangipane overflowed all over the place. Good thing I had a baking sheet underneath the tart pan! You can see the explosion in the pictures below! It still turned out well after a little bit of clean up, no problem, just a little messy! The saddest part of this whole Memorial Day party post is the fact that I didn't even make it to any of the festivities. I drove to my parents house in the morning to watch the parade, but as soon as I got there I was contacted by the hospital. I was on call on Memorial Day and had to turn right around and go to the hospital where I spent the next 5 hours. Sigh. I missed the parade and brunch. My sister brought my tart to lunch so everyone else could enjoy, but I did not get to join in the party. I was super bummed. But such is life. At least I got to have a fun time putting it all together! Form into a dis and wrap the pastry then chill for 30 minutes, but up to 1 day. When ready to bake: Roll out, between cling wrap and fit into standard sized tart shell. Prick the dough (and rechill if it has warmed up too much) and then using baking beads or rice, blind bake at 350°F until the dough is golden brown (about 20 min). Toss the rhubarb with sugar, orange juice, and orange zest. Let sit in fridge (up to overnight). Spread strawberry jam over bottom of par cooked shell. For the Frangipane: Beat together the sugar, butter, almonds, eggs, almond extract, baking powder, salt and flour until creamy. Spoon the mixture over the strawberry-rhubarb purée. 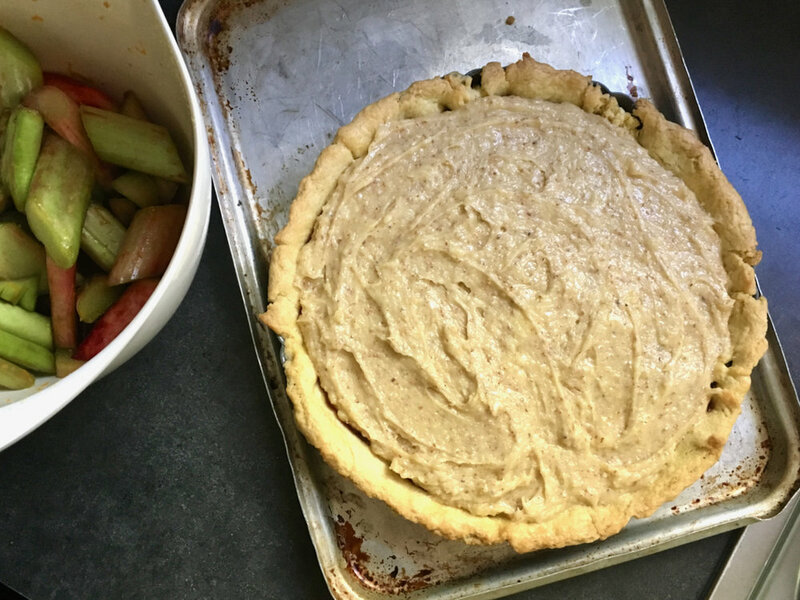 Arrange the rhubarb on top of the frangipane. If using the herringbone method, place rhubarb accordingly. Bake for 50-55 minutes, or until golden and risen. Cool in the tin until warm. Well, June is here and after a chilly start to the week, it finally feels like it has actually arrived here in Michigan. June is a wonderful month, but for all it's greatness I think my favorite thing about June may be strawberries!! We wait so long for such a short season, but I try to enjoy every minute of it. This Greek yogurt tart is the perfect way to showcase this fruit in all of its splendor. I actually made this tart a few weeks back for a Memorial Day brunch I attended, but now that local strawberries are just beginning to arrive at the Farmer's market it's the perfect opportunity to give this recipe a try. Of course, as the summer goes on and other fruits come into season this tart can be adapted to pretty much whatever fruit you have on hand in a given moment. I was looking for something fresh, light and delicious to make for my brunch and my mind kept focusing on some kind of fresh tart. I didn't want it to have a traditional crust, but wanted something a little different. While browsing recipes I came across a savory sunflower seed crust over at Natural Girl Modern World and was intrigued. I decided to try adapting it a bit to work for me in a sweet application. With a few tweaks it came out great! More like a giant cookie crust as opposed to a traditional tart crust, exactly what I was looking for. It was perfect topped with some yogurt and fruit, kind of twist on the more traditional fruit and yogurt parfait - delicious. For the filling of this tart I wanted to go very simple. I took my homemade yogurt and strained it for several days until very thick and incredibly creamy. Store-bought yogurt would work just fine too, just make sure to buy plain yogurt to strain, not the flavored stuff, you can add sugar and flavorings yourself. To the very thick yogurt I gently added a little honey, a little brown sugar, and some lemon zest. Not a lot of sugar, but just enough to add a touch of sweetness. Just taste and adjust until the flavors are to your liking. I spooned this sweetened yogurt into the crust and topped with the sliced berries. Done! Fresh and light, exactly what I was hoping for. In a food processor, blend oats until the texture of coarse sand. Add sunflower seeds and salt and blend until the seeds are also a crumb-like texture. This should only take 30 seconds to 1 minute. Over-blend and you'll start to make nut butter. Add the flour and pulse a few times to combine. Add the chilled butter and pulse a couple of times, until starting to come together. Add the honey and continue to pulse until a ball of dough forms. It will be sticky. Wrap dough in plastic wrap and place into the back of your freezer for about 15 minutes, or refrigerate for a couple of hours or overnight. While the dough chills, preheat oven to 350 degrees. Remove dough from freezer and press it into prepared greased 9 inch tart pan with a removable bottom. Aim for an even distribution of dough throughout the pan, pressing the dough together firmly to create a solid base. Using a fork, prick the bottom of the crust thoroughly to allow air to escape when baking. Bake for 20-25 minutes. Keep an eye on it towards the end of baking to ensure the edges don't over-brown. Set aside to cool before filling. I haven't always been a big pie fan. In fact, it's only been in the last year that I've really changed my tune and started to really like pies, a lot! (Don't worry cake, you will forever be my first love.) I was never a big fan of soft, warm fruit, and while it is still not on my top 10, when it's encased in a flaky and buttery crust, generously sprinkled with sugar, and baked until golden perfection it's difficult for me not to like. Since I've jumped on the pie band wagon I decided it was time that my Thanksgiving dinner included an apple pie, it just seemed right. No doubts here; this pie was tall and handsome, but more importantly the taste was spot on, the perfect blend of sweet and buttery, tender apples and flaky crust. A wonderful start to my holiday season. First ever double crusted pie! I was a little nervous, but knew it would work. It baked up beautifully with no worries. I did cover it with foil about halfway through baking because I do not at all like over-baked crusts. I like a light golden brown, not dark and hard. The perfect ending for my delicious Thanksgiving meal. For the crust: using a cheese grater, grate the butter into a bowl and place in the freezer for a few minutes to freeze. In a large bowl mix together flour, salt and sugar. Add the frozen butter and quickly mix together. Add in the ice water a little bit at a time just until the dough comes together in a ball. Add as little water as needed, it's okay if the dough is a little shaggy. Split the dough into two pieces and shape into a disc. Wrap each disc in plastic wrap and place in fridge for at least 2 hours. On a lightly floured work surface, roll out half of the dough into a 12-inch round about 1/8 inch thick. Transfer the dough to a 9-inch deep-dish pie dish and gently press the dough into the bottom and sides of the dish. Trim the edges and refrigerate for 30 minutes. Roll out the remaining dough disk into a 12-inch round about 1/8 inch thick. Refrigerate for 30 minutes. Transfer the apple filling to the pie shell, and gently invert the top over the pie. Trim the edges flush with the rim of the dish and press the top and bottom crusts together to seal. Brush the entire top crust with egg wash and sprinkle with the granulated sugar. Cut a couple of slits in the dough to allow steam to escape. Place the pie dish on the preheated baking sheet. Bake at 400 degrees for 20 minutes, then reduce the temperature to 350 degrees and continue baking until the crust is crisp and golden brown, about 40 minutes more, covering the edges with aluminum foil if they become too dark. Transfer the pie to a wire rack and let cool for at least 1 1/2 hours before serving. Strawberry season is basically over, this is always a sad realization to me since strawberries are my favorite fruit. I love buying a couple quarts at the farmers market and then stuffing my face full of sweet, juicy berries because we all know that freshly picked strawberries last about a day before they start going bad. To me this means I am required to eat as many as possible because I can't let any of these early summer jewels go to waste. This is a task I attack with pleasure. This year I definitely did my share helping out the local strawberry farmers. This sometime required me to become creative with the baskets and baskets lining my counter. I had a wonderful time figuring out what to do with all of my strawberries, what a fantastic problem! When my neighbor called and told me she had rhubarb galore and I needed to come take some off of her hands I jumped at the opportunity. I had never made a strawberry rhubarb pie, but that was all about to change. Strawberry and rhubarb are my favorite combination. The juicy sweetness of the strawberries combined with the puckering tartness of the rhubarb is a match made in heaven. I'm already looking forward to next year! While I've been making more pies and tarts recently, I still would definitely call myself an amateur. I'm getting better, but I still have things I need to work on. Regardless, this pie turned out absolutely delicious, even if it lacks a little in the looks department. I like to think of it as rustic. In the end it really doesn't matter what the pie looks like, the most important thing is what it tastes like, and this one did not disappoint. Note: This is a rough estimate of my strawberry rhubarb pie recipe. It was delicious, but it could definitely have used more filling, both strawberries and rhubarb. Feel free to play around with the quantities, increasing the filling until you are satisfied with it. For the topping: this time around I didn't melt the butter, but for future use I probably would. I think you get bigger chunks of streusel then. Also, if you are a big streusel fan (like me) you'll want to increase the amount of streusel. Try doubling it perhaps! Preheat oven to 375 degrees. Make the filling: Mix together rhubarb, strawberries, granulated sugar, brown sugar, cornstarch, vanilla, and liquor. Set aside. Make the crust: Roll out pate brisee to a 1/8-inch thickness on a lightly floured surface. Fit dough into a 9-inch pie plate. Place in refrigerator or freezer for 15-30 minutes, until well chilled. Drain excess juice from the rhubarb/berry mixture. Pour filling into chilled pie crust. Bake pie for 45-55 minutes, until crust is well browned. Remove from oven and cool. Enjoy with vanilla ice cream or lightly whipped cream. After making my Tomato Tart last week I had a good chunk of tart dough leftover. Not wanting to waste any of this buttery goodness I pressed the pieces I had left into a few mini tart pans and threw them in the freezer. This week I had a few peaches sitting on the counter just crying out to be used. What to do? Then, what do you know, the King Arthur Flour Baker's Companion magazine showed up in the mail with a recipe for an almond tart. Out of all of this inspiration these peach tartlets appeared. It was the perfect solution to a very wonderful problem! I took the recipe for the almond tarts and added some delicious peaches. I love the combination of almond and peach so I knew this was going to be good. I spread the peaches on the chilled crust and then topped with the filling. It worked out quite well, but when I try it again I would try to remember to save a few peach slices to lay on top of the filling too. This would make the finished product look even better I think. But they were still delicious as they were. 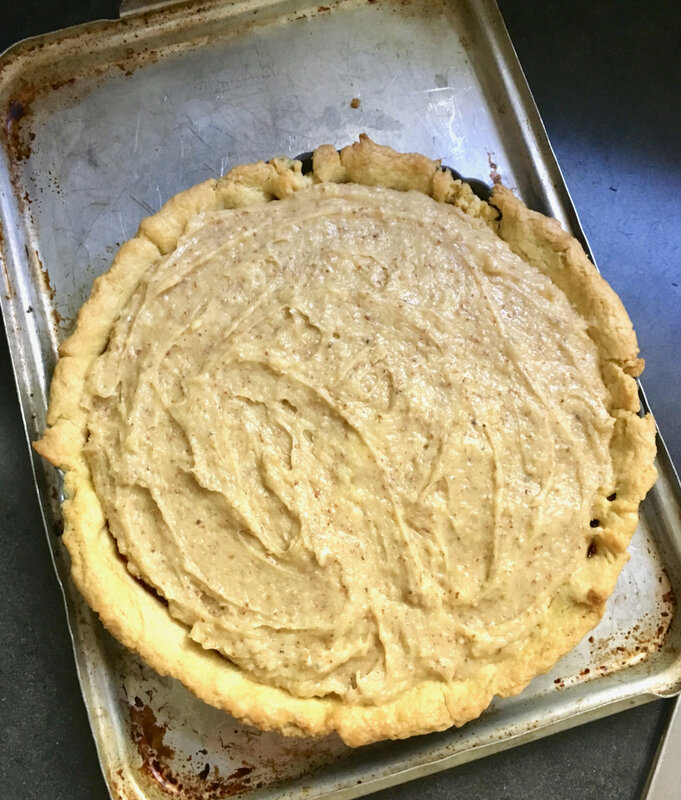 This is a great versatile tart that I can think will be the perfect starting point for many other delicious tarts this summer! To make the filling: Beat together the butter, salt, sugar, flour, and extracts. Beat in the eggs, then add the almond flour, stirring just to combine. Lay sliced peaches onto the well chilled crust. Spread the filling over the peaches. Bake the tarts for 18 to 24 minutes, until their tops are lightly browned. Remove from the oven, and cool in the pans. To make the glaze: Stir together the sugar and milk until smooth. Spread the glaze over the cooled tarts. Top with some whipped cream or a scoop of ice cream if desired. While it's not tomato season yet in Michigan, the farmers market is starting to have some very nice greenhouse tomatoes that are actually pretty good. I've picked up a few over the last couple weeks and have been quite happy with them, on sandwiches or salads. Over the winter I've forgotten how much I love having fresh tomatoes around, they are so useful and so delicious. They may not be fresh from the garden, still warm from the sun tomatoes, but I am happy with them for now, and they worked perfectly in this tomato tart. This tart is basically just a pizza in a different form, and it was delicious. Spreading an entire head of roasted garlic on the crust is a brilliant start. Since I had mozzarella in the freezer, I used that instead of the Fontina which was called for. I would have loved to use Fontina, but the mozzarella was still very good. Fresh basil on top was the perfect finishing touch. I thought this tart was just wonderful, and I can't wait to make it again with my very own tomatoes, fresh from the garden. Preheat oven to 350 degrees. Place the garlic on a piece of foil; drizzle with 1 tablespoon of the olive oil. Fold the foil up around the garlic, sealing the edges, and place on a baking sheet. Roast in the oven until golden brown and the tip of a sharp knife easily pierces the flesh, about 45 minutes. Remove from oven and set aside. Raise the oven temperature to 450 degrees. When garlic is cool enough to handle, squeeze the clovees out of their skins and into a small bowl, mash with fork and set aside. On a lightly floured work surface, roll out the dough to a 13 inch round, about 1/8 inch thick. Fit the dough into a 10 inch fluted tart pan with removable bottom, pressing into the edges. 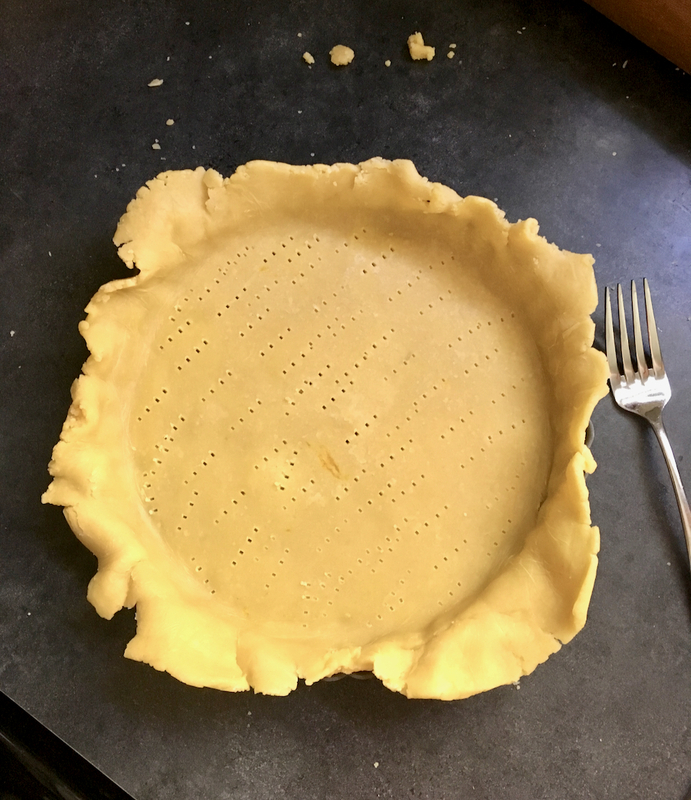 Using a rolling pin or a sharp paring knife, trim dough flush with the top edge of the tart pan; chill tart shell until firm, about 30 minutes. Spread roasted garlic evenly on the bottom of the chilled shell. Sprinkle with 1/4 cup cheese. Arrange the tomato slices in an overlapping circular pattern on top of the cheese, working from the out edge toward the center. Season with salt and pepper. Sprinkle with remaining 1/2 cup cheese, and drizzle with remaining 2 tablespoons oil. Reduce oven temperature to 425 degrees. Bake tart until crust is golden and tomatoes are soft but still retain their shape, 45 to 55 minutes. Cool on a wire rack for 20 minutes. Thinly slice basil leaves lengthwise. Sprinkle tart with basil, and serve warm. With the machine running, add the ice water through the feed tube in a slow, steady stream, just until the dough holds together with out being wet or sticky. Do not process more than 30 seconds. Test by squeezing a small amount of the dough together; if it is still to crumbly, add a bit more water, 1 tablespoon at a time. Turn out the dough onto a clean work surface. Divide in half, and place each half on a piece of plastic wrap. Shape into flattened disks. Wrap in plastic, and refrigerate at least 1 hour, or overnight. The dough can be frozen for up to 1 month; thaw overnight in the refrigerator before using. Thanksgiving's over and the Christmas season is officially upon us. I don't know about you, but I'm pretty excited! But before all festivities begin I have to share what I made for Thanksgiving dessert this year. My whole family went to my grandparents place this year and had a wonderful time. My mom, Lara and I were in charge of bringing a couple of different things, including dessert of course! When I was trying to think of what to bring, Lara reminded me of this French Silk Pie that we have been wanting to make. Chocolate, cream, eggs, butter and sugar lying gently on a flaky, buttery pie crust. The perfect complement to our fabulous Thanksgiving dinner. It was a big hit, and a great recipe to have in your arsenal when looking for a rich, chocolaty dessert. This pie is basically a chocolate mousse in a crust. The buttery crust is a nice complement for the smooth chocolate filling. The eggs are cooked on the stove with sugar and water so if you get worried about things like raw eggs (I don't) you have nothing to fear in this recipe. After the eggs are cooked you add in the chocolate, the butter, and finally fold in the whipped cream. Nothing too difficult, it just takes a little time. Scrape the filling into the pie crust and slide the whole thing into the fridge overnight. The next morning your dessert is ready! If you want, you can finish it off with some whipped cream, or just dig in. Either way it will be delicious! With electric mixer on medium-high speed, whip cream to stiff peaks, 2 to 3 minutes. Transfer whipped cream to small bowl and refrigerate. Combine eggs, sugar, and water in large heatproof bowl set over medium saucepan filled with ½ inch barely simmering water (don’t let bowl touch water). With electric mixer on medium speed, beat until egg mixture is thickened and registers 160 degrees, 7 to 10 minutes. Remove bowl from heat and continue to beat egg mixture until fluffy and cooled to room temperature, about 8 minutes. Add chocolate and vanilla to cool egg mixture and beat until incorporated. Beat in butter, a few pieces at a time, until well combined. Using spatula, fold in whipped cream until no streaks of white remain. Scrape filling into pie shell and refrigerate until set, at least 3 hours and up to 24 hours. Serve with lightly sweetned whipped cream and chocolate shavings. Adjust oven rack to lowest position, place rimmed baking sheet on oven rack, and heat oven to 425 degrees. Remove dough from refrigerator and roll out on generously floured (up to ¼ cup) work surface to 12-inch circle about 1/8 inch thick. Roll dough loosely around rolling pin and unroll into pie plate, leaving at least 1-inch overhang on each side. Working around circumference, ease dough into plate by gently lifting edge of dough with one hand while pressing into plate bottom with other hand. Leave overhanging dough in place; refrigerate until dough is firm, about 30 minutes. Trim overhang to ½ inch beyond lip of pie plate. Fold overhang under itself; folded edge should be flush with edge of pie plate. Flute dough or press the tines of a fork against dough to flatten it against rim of pie plate. Refrigerate dough-lined plate until firm, about 15 minutes. Remove pie pan from refrigerator, line crust with foil, and fill with pie weights or pennies. Bake for 15 minutes. Remove foil and weights, rotate plate, and bake for 5 to 10 minutes additional minutes until crust is golden brown and crisp.